These are the items that were included on the "Late Breaking Website News" page in 2018. Items are listed with the most recent one first, and each article carries the posting date indicating when it was first uploaded. You should find this an interesting look at the important Shroud and Website events in 2018. 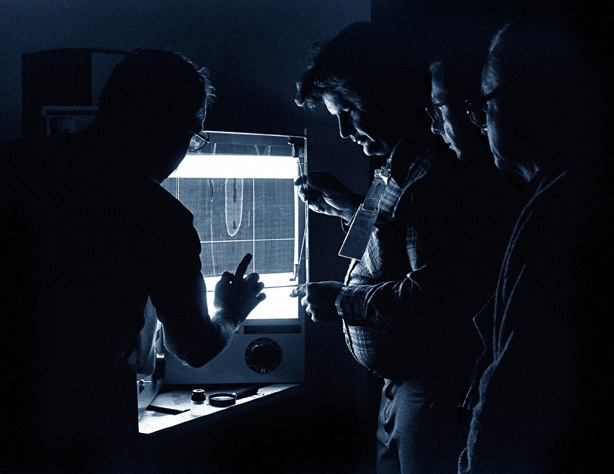 Forty years ago today, on October 8, 1978, the Shroud of Turin Research Project (STURP) team began their historic, first ever in-depth scientific examination of the Shroud of Turin in a makeshift "laboratory" in the Royal Palace of Turin. The examination took place over a period of five days and nights, from October 8 through 13, 1978. In commemoration of that historic event, we have been celebrating the anniversary year by including some special materials in each of our regular website updates and culminating with this Special STURP Update today. After forty years, we felt it was time to publish ALL twenty of STURP's original, peer-reviewed papers, so they are now available to everyone (for the first time on the internet) here on Shroud.com. See our lead off article below for details and links. We are also including a memorial for our dear friend and internationally respected Shroud scholar Paul Maloney, who died unexpectedly on August 27th. Also included in today's update is a response to the recent flurry of negative media attention the Shroud received that was prompted by a paper published by two Italian skeptics. Other articles include an update on this year's Jalsa Salana Shroud Conference in England, news from STERA, Inc., an update on the Shroud Billboard Project in South Carolina and the start of our once-a-year annual fundraising effort. This update also brings you ten more issues of Rex Morgan's Shroud News, a feature article and beautiful photographic essay by our dear friend Aldo Guerreschi on the newly restored and reopened Guarini Chapel in Turin, many new books, papers, articles, videos and a few surprises. Enjoy! Today Marks the 40th Anniversary of STURP's Historic 1978 Shroud Examination - Part 3 - All STURP's Published Papers Now Available! 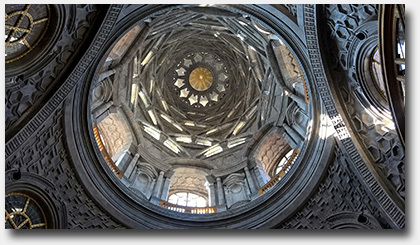 News From Turin: Guarini Chapel Reopened - New Photographs by Aldo Guerreschi! All STURP's Published Papers Now Available! 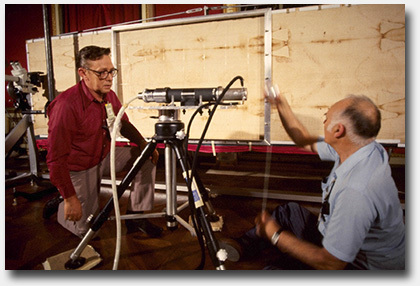 The above photograph shows Ron London and Bill Mottern setting up their low power x-ray machine, the same device that was at least in part responsible for the seizing of all of STURP's equipment by Italian customs upon its arrival in Italy back in 1978. The wooden crate that housed the x-ray machine had a radiation sticker on the outside, and that apparently raised enough concern to cause the customs officials to seize everything and refuse to release it upon our arrival. We arrived a week prior to the scheduled start of our examination (while the Shroud was still on public display) in order to unpack, set up and calibrate all our instruments and equipment so we would be fully prepared when the Shroud was brought to us. Unfortunately, it took five and a half days before the equipment was finally released so we had to work around the clock for the remaining 36 hours to prepare everything for our testing. We were still finishing our preparations when the Shroud was brought into the examination room, a full hour and a half ahead of schedule! In spite of the pressure and stressful circumstances, everyone pulled together, worked as a team and we got the job done! 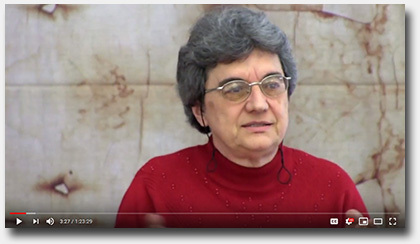 In our January 2018 update I re-released the special tribute video I produced for the 30th anniversary of the STURP team's examination in 2008, titled, "A Tribute to the STURP Team 1978 - 2008," which was first shown at the 2008 Columbus, Ohio Shroud Conference. 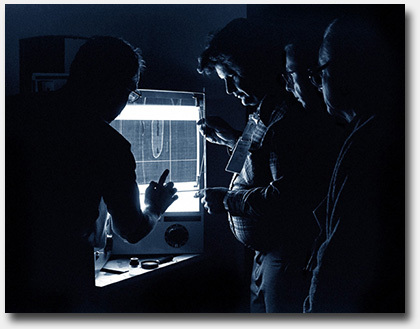 In our June 2018 update we published the original STURP Test Plan, formally titled, Operations Test Plan For Investigating the Shroud of Turin by Electromagnetic Radiation at Various Wavelengths, and made it available online for the very first time. We have permanently archived links to the Test Plan on our Main Menu and 1978 Scientific Examination pages. I wanted to do something special for today's update and spent a lot of time thinking about it. 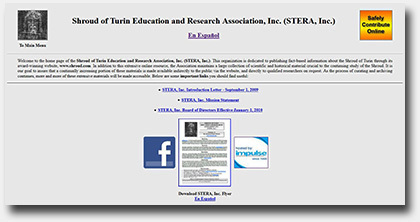 Since we first went online on January 21, 1996, we have included a Bibliography of STURP's published papers, but were unable to publish the papers themselves due to copyright restrictions. Considering the historic importance of the work, that has always been one of my biggest frustrations, especially now on our 40th anniversary. However, in 2009 the ownership of this website and all of my Shroud photographs and other materials was legally transferred to our 501(c)(3) non-profit organization, STERA, Inc., an organization dedicated to educating people about the Shroud and archiving online the most important Shroud materials for future research. Since we provide the information for educational purposes and are effectively the single largest Shroud resource on the internet, we believe we now fall well within the Fair Usage clause of the copyright law. Furthermore, there is no charge to access any of the content on this website nor do we permit any type of advertising so we derive no commercial benefits from their publication. Based on those facts, I decided to publish all twenty of the papers in this update and have simply renamed the "Bibliography of STURP's Published Papers" page: STURP'S Published Papers. We have also added all the papers to the Website Library and Scientific Papers & Articles pages. Of course, should any author prefer to have their paper removed, we will gladly do so upon written request. In the meantime, Happy 40th Anniversary STURP! It is with the deepest sadness and regret that I must report the unexpected passing of our dear friend and colleague, archaeologist Paul Maloney, peacefully at his home in Quakertown, Pennsylvania, on August 27, 2018. Paul was one of the most respected Shroud scholars in the world and the news of his passing came as a great shock to the Shroud community. Within hours the comments poured in from Shroud scholars and researchers around the world. Many of the comments were from the online Shroud Science Group, of which Paul was a truly valued member, so I have included them in this memorial. In fact, there were so many comments that I have compiled them into a separate document titled, Paul Maloney Memorial. It also includes a transcript of the Eulogy presented at his funeral on September 1, 2018 by Shroud Science Group member Massimo Paris. Here is the link to the official Paul Maloney Obituary and a link to the obituary we included on the STERA, Inc. Facebook page that includes many more notes of condolence. I may have a serious medical problem and might have to go into the hospital today. So just in case that I don't come out of this where I can get to a computer to send you this material about the Max Frei map I want to send it now so you'll have it. Having spent the day in airports and airplanes, it wasn't until late that night when I checked my home phone messages from the hotel in Indiana that I heard a message from Mark Maloney, Paul's son, who I had never spoken with before. He asked that I contact him and that it was urgent, so I immediately had a bad feeling about things. However, it was far too late to return the call that night, so I went to sleep not knowing what the situation was. The next morning, I turned on my computer and found the e-mails announcing Paul's death. Needless to say, it made the e-mail I received from Paul even more poignant, as if he had some kind of premonition that morning. I called and left a message for Mark and he returned the call a bit later that day. He told me that Paul returned home from the doctor's office, decided to take a nap and never woke up. I told Mark about Paul's final e-mail to me and we both fought back the tears. It was a difficult moment. More recently, I had a rather tearful conversation with Lois Maloney, Paul's widow, and she asked me to please continue the work Paul and I had started together. Since Paul sent me the last version of his map paper, we agreed that I should publish it in its current form and we have included it in the links below (as well as on the Website Library and Scientific Papers & Articles pages). The third project Paul and I were working on was the digitizing of over 5000 photomicrographs on 35mm color slides that Paul had made of the Max Frei tape samples when they were in his possession. He was in the process of annotating the slides but had not yet completed the task when he died. Once he had completed that phase I was to start digitizing the images. Since this was the most important (and the largest) of the three projects, Lois has agreed to allow STERA, Inc. to take up the work and finish as best we can what Paul began. We have yet to work out the details but I hope to have more news in our next update. I will conclude this part of the memorial with some links to important Paul Maloney materials. Rest in Peace my dear friend. You surely will be missed. The Max Frei 1978 Sticky Tape Locations, Data Foundation and Accompanying Critical-Analytical Commentary - Paul's final paper. With this update we add ten more issues to Rex Morgan's Shroud News archive, which will total 118 issues when complete. This update includes Issue #101, April 1997 through Issue #110, October 1998 and leaves only eight issues remaining until the archive is completed. This group of issues includes coverage of the April 1997 Chapel fire in Turin, the May 1997 Nice Symposium, the 1998 public exhibition, the 3rd International Shroud Congress in Turin and contributions by such notables as Maurizio Paolicci, Rex Morgan, Revd. Kim Dreisbach, Joe Marino, Isabel Piczek, Sr. M. Dympna, William Meacham, Remi Van Haelst, Fr Peter Little, SJ, Giampiero Leo, Mark Guscin, Barbara Stinson Lee and many more. Our sincerest thanks as always to Stephen Jones for his extraordinary effort in scanning and optical character recognition of every page, Ian Wilson for providing the original issues and valuable input and of course, to Rex Morgan for his gracious permission to reprint them here on Shroud.com. LAST MINUTE ADDITION: On Friday night, October 5th, I received an e-mail from my dear friend and brother photographer, Aldo Guerreschi, in Turin. I was thrilled to hear from my old friend but even more thrilled to see the selection of beautiful photographs of the restored Guarini Chapel that Aldo sent me just in time for this update! Thank you Aldo! The images are so beautiful that I have put them into a single document titled, The Guarini Chapel by Aldo Guerreschi and am sharing it here with all of you. Enjoy! 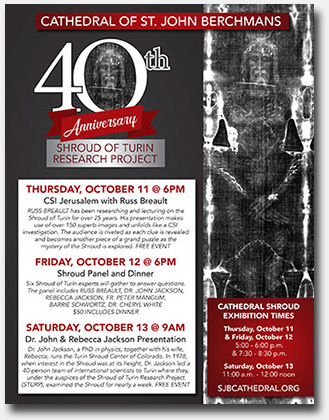 On October 11 -13, 2018, the Cathedral of St. John Berchmans in Shreveport, Louisiana is hosting a series of events to celebrate the 40th anniversary of the STURP team's examination of the Shroud in 1978. Participants will include Russ Breault, John and Rebecca Jackson, Dr. Cheryl White, Fr. Peter Mangum and me. It is worth noting that John and I are both original members of the STURP team and we are truly grateful to the folks at St. John Berchmans for sponsoring the event, which includes a presentation by Russ on October 11th, a Panel Discussion on October 12th with all of the participants and a presentation on October 13th by John and Rebecca. 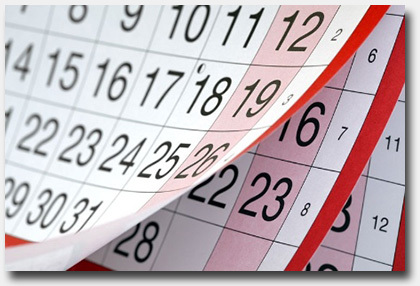 You can find the schedule and get all the details on the St. John Berchmans Website. We look forward to meeting some of you there. On August 3, 4, 5, 2018, I had the pleasure of attending the annual Jalsa Salana Convention of the Ahmadiyya Muslim Community in Hampshire, England for the fourth year in a row. For the past four years, the Review of Religions magazine, the 113 year old publication of the Ahmadiyya community, has sponsored a Shroud Conference at the Jalsa that has grown in scope and size to become the single largest annual Shroud event anywhere in the world, with nearly 38,000 attendees this year! I think the irony is obvious. Once again, Pam Moon brought her beautiful Shroud Exhibition (which typically tours around the U.K. each year), her amazing volunteer associates Brenda and Stuart Benton and Luigi Antoniaz and set up the exhibit in the very large tent or marquee that the Review of Religions provides annually for the Shroud Conference. I might add that this year, the marquee was huge and held not only the exhibition, but a small stage and seating for a substantial audience. Because of the record high temperatures in England this year, the marquee was also fully air conditioned. But perhaps the best part of this year's Jalsa was the illustrious group of international Shroud scholars that made presentations at the event. There for his second Jalsa was Bruno Barberis, Past-President of the International Center of Sindonology in Turin. 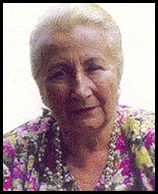 Attending her first Jalsa was world renowned Shroud scholar Emanuela Marinelli from Rome. The Review organizers were thrilled to have Emanuela present since she could address the women at the event. Much like Orthodox Jews in their synagogues, Muslims typically separate the men from the women at these events, so we presented to each group individually. Mark Guscin from Spain had originally been scheduled to attend and discuss the Sudarium (as he did for the first time last year). Unfortunately, he had to cancel due to other obligations so Emanuela contacted our dear friend Jorge Manuel Rodrigues Almenar, President of the Centro Espanol di Sindonolgia (CES) or Spanish Center of Sindonology in Valencia, Spain, and he graciously accepted the invitation. It was great to see him again! 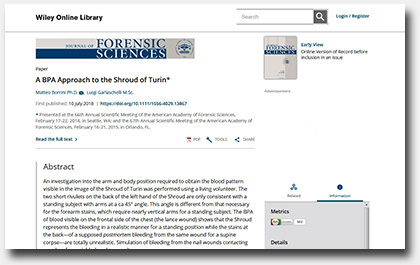 On July 10, 2018, a paper titled, A BPA Approach to the Shroud of Turin by Matteo Borrini and Luigi Garlaschelli was published in the Journal of Forensic Sciences. In essence, it stated that some of the bloodstains on the Shroud were "unrealistic," so consequently, the Shroud must be a "fake." Never mind the fact that the authors used artificial blood on the body of a plastic mannequin for their experiments and didn't take into consideration that the surface of the actual victim's skin would have been dramatically different than their plastic "dummy" due to perspiration, merciless beating and severe trauma. Never mind the fact that they totally ignored all of the peer reviewed science published in the literature based on direct examination of the Shroud that challenged their conclusions. Of course, regular viewers will recognize Garlaschelli as a long time vocal skeptic of the Shroud and a researcher who consistently brags that he is funded by an athiest group in Italy. Within a few days the media coverage began and from there it basically went viral. I learned of it when an avalanche of e-mails flooded my mailbox, asking me my thoughts on these new claims. I often say that "Shroud is a Fake!" makes a better headline than all the science that proved it was not a fake. That was certainly true in this case. Sadly, I was in the midst of a very busy travel and lecture schedule and could not address the paper immediately, so I responded to many of the folks who wrote to me via return e-mail. Finally, on July 19, 2018, I was able to post a brief comment about the paper on our STERA, Inc. Facebook page. Answer to the Article 'A BPA Approach to the Shroud of Turin' by Alfonso S�nchez Hermosilla, M.D., Forensic Anthropologist, Cartagena, Spain - July 18, 2018 - The original article appeared in the Spanish language as breaking news on the La Sindone en Canarias (The Shroud in the Canary Islands) website. Here's the link: Respuesta de un forense al experimento de Garlaschelli. The English translation was posted to the online Shroud Science Group (SSG) on July 21, 2018. The article also appeared in the Italian language on the International Center of Sindonology website on July 19, 2018 at this link: Risposta all�articolo �Un approccio BPA alla Sindone di Torino�. Shroud: Blood Pattern Analyses are not accurate and require new studies by Paolo Di Lazzaro, Vice-President, International Center of Sindonology (CIS) in Turin - Posted to the online Shroud Science Group (SSG) - July 21, 2018 - Official response of the CIS. Turin Shroud: Believers hit back in almighty row over whether famous piece of cloth really did contain Jesus' body by Adam Lusher, The Independent, Friday, August 3, 2018. This article was based on a Press Conference held on August 3, 2018, at the Shroud of Turin Conference hosted by the Review of Religions magazine and held at the Jalsa Salana Convention of the Ahmadiyya Muslim Community in Hampshire, England. The article includes a video clip from the press conference that featured Bruno Barberis, Emanuela Marinelli, Jorge Manuel Rodrigues Almenar and myself. I was surprised to find that they edited together several of my responses for their video clip. Evaluation of �A BPA Approach to the Shroud of Turin� by Robert A. Rucker - Posted to the online Shroud Science Group (SSG) on October 4, 2018 - This version dated September 27, 2018 is the final version of the paper. There may be other responses being prepared by other Shroud scholars and we will either update this article once they become available or include them in a future update. 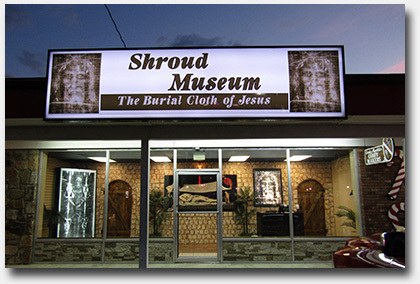 I am pleased to announce that a new Shroud Museum is opening on October 20, 2018 in Pigeon Forge, Tennessee. 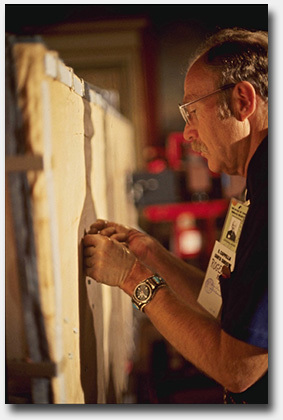 The museum's founder, Lonnie Abrams, contacted us more than a year ago and we worked with him to provide many of the images they have on display, including a lifesize replica of the Shroud and photographs of the STURP team at work. The exhibit also includes a full size Garden Tomb, implements of the Passion and much more. The museum is located at 2684 Parkway, Pigeonforge, Tennessee 37863, and will be open seven days a week, from 10:00 a.m. to 11:00 p.m. Phone: 865-366-3770. Pigeon Forge is a mountain town and vacation area in eastern Tennessee, and the home of Dollywood, country singer Dolly Parton's Appalachian-themed park consisting of rides, an adjoining water park and a museum of her costumes and memorabilia. The city's other attractions include country music revues like the Smoky Mountain Opry, dinner theaters such as Dolly Parton's Dixie Stampede and outlet malls. Lonnie's goal is to make the Shroud available to the 11-13 million tourists that visit the area each year. We hope to include a more in-depth story and photographs in a future update. Update: The Museum opening has been delayed because, at the last minute, the city of Pigeon Forge required Lonnie to add another bathroom to the museum before it can open to the public. Lonnie is working as fast as he can to meet the new requirment and will let us know the new opening date as soon as it is scheduled. 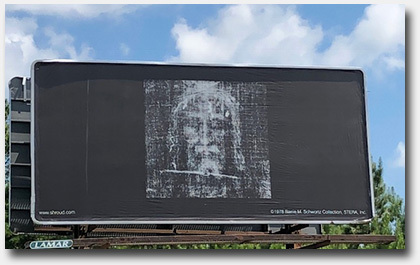 In our January 2017 website update we introduced the Shroud Billboard Project, modeled on a project by an organization in Dublin, Ireland that published billboards of the Shroud face without any accompanying text or verbiage and created quite a strong public reaction. I was contacted by Val Kelly, who, with her small prayer group in South Carolina, wanted to duplicate the idea near her home in Hilton Head and asked me what it would take to obtain an image for that purpose. I liked the idea of a Shroud image without any text since each person who saw it would have to think about it and ultimately decide what it meant for themselves. I provided the image and Val and her prayer group funded the production of a test billboard that has remained in place ever since. You can read more about it and get all the details of the original project at the above link. Recently, Val contacted me again with an update on the project, which is making some serious progress. 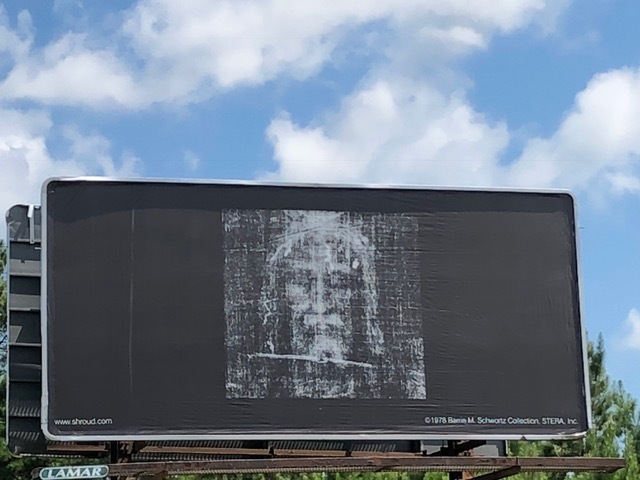 The Holy Face Project has established The Holy Face Project Fund in partnership with the Community Foundation of the Lowcountry, a 501(c)(3) non-profit organization, so they can raise funds for additional billboards. All contributions to the Fund are fully tax deductible as allowable by law. Here is a donate link that takes you directly to the appropriate landing page: Support the Holy Face Project. I have also included a separate document titled, The Holy Face Billboard Project where you can find additonal details and more information on how you can participate and support the project. Val also sent us a more recent photograph of the current billboard, which we have included above. I first started working with the Vancouver Shroud Association (VSA) in 2004, when the then newly-formed organization contacted me to help design their new Man of the Shroud traveling exhibit. For several months I worked with their exhibit designer (who also happened to curate a museum in Vancouver), and provided images and written materials for the thirty museum boards that would become part of the final exhibit. 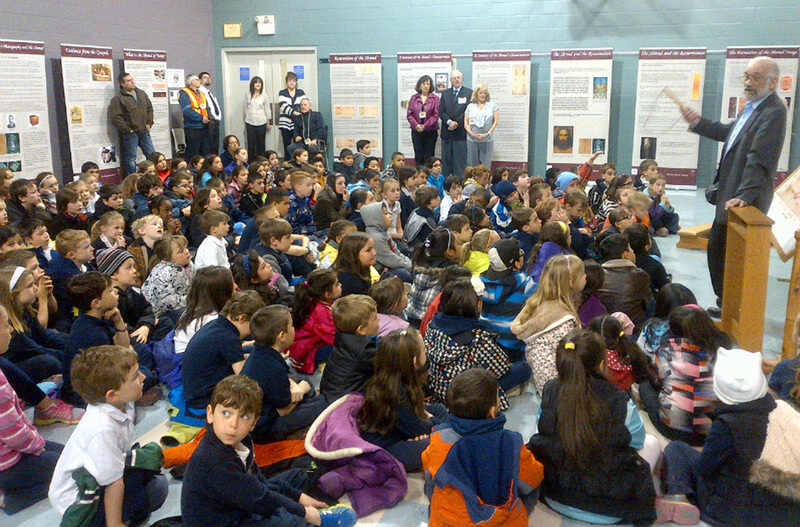 Since then, the exhibit has traveled and been hosted at parishes in many provinces across Canada. I have continued to work with them to help keep the exhibit up-to-date and several years ago became a member of their Board of Directors. I travel to Canada at least once each year to make presentations around the exhibit (I spoke in Calgary earlier this year) and at a recent Board Meeting the Directors of the VSA agreed to expand the scope of the exhibit by accepting invitations from the United States for the first time. 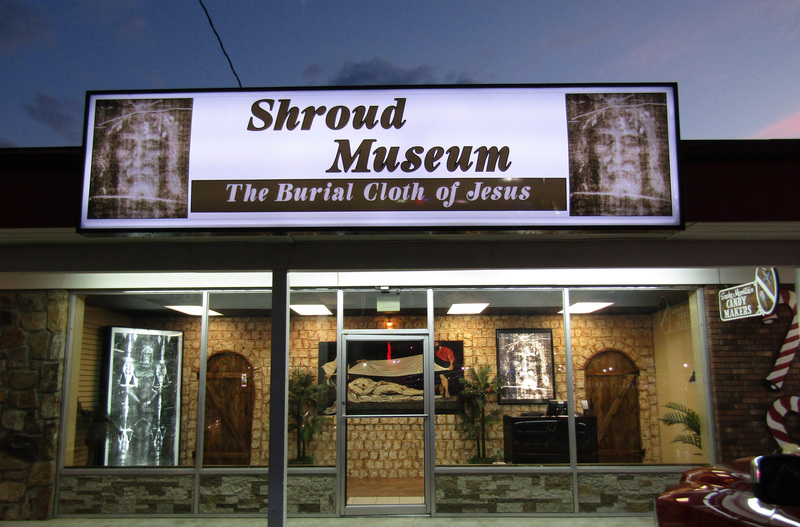 This museum quality display includes a life size Enrie photographic replica of the Shroud of Turin, a specially designed display easel for positioning the Shroud replica above an altar; replicas of Christ's Passion and the Sudarium of Oviedo and 30 panels with text and color images relating to the history, science and significance of the Shroud of Turin. The exhibit provides an excellent opportunity for parishes to sponsor a major local event, particularly during the Lenten season. The VSA is also pleased to recommend excellent Shroud presenters upon request. For details about the exhibit and booking information, please visit their website at www.manoftheshroud.org and select their contact page for communication purposes. At the July 15, 2018 Board of Directors Meeting, the STERA, Inc. Board accepted the retirement and emeritus status of Board member Joan Rogers, who will continue to remain available for consultations if needed. This created the need to select and approve a new Board member to take her place. In evaluating potential candidates, one name came to mind immediately, and I recommended Raymond Schneider to fill the position. For those who might not know Ray, he is Professor Emeritus of Mathematics and Information Technology at Bridgewater College, a contributing member of the online Shroud Science Group and a highly respected Shroud scholar. I am pleased to announce that the Board approved his selection unanimously and Ray is now the newest member of the STERA, Inc. Board of Directors. Here is a link to a list of the Current STERA, Inc. Board of Directors. Congratulations Ray! We look forward to working with you. As I have stated in the past, I love the work I do as editor of this website and as President of STERA, Inc., but one of the most difficult (and uncomfortable) responsibilities I have is raising funds each year in the form of tax deductible contributions to support the website and our other long term projects. Frankly, with the large number of visitors we have each year, we could generate substantial revenue by allowing advertising on the site, but we have never allowed ads in our 23 year history and have no intention of allowing them in the future! That means that we need your support to help make up the difference. 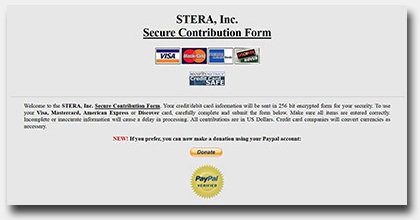 As President of STERA, Inc., I am obligated to solicit contributions from our viewers and subscribers, just like every other non-profit in the world. Of course, unlike most non-profits, we only have one annual fundraising effort near the end of each year. We prefer not to bombard you with continuous requests for contributions during the course of the year (which I am sure you appreciate). But now, that time has come again so here are some reminders of the ways you can support STERA, Inc.
You can also support STERA, Inc. and Shroud.com by purchasing items directly from our Website Store page. With the holidays fast approaching, you might want to look at some of the items we make available, including a miniature Shroud replica on cotton canvas, a set of high quality lithographic prints, several different Shroud transparencies in backlit PhotoGlow frames and a number of DVD's. Any of them would make great gifts for your favorite Shroudie! Order by December 15, 2018 for Christmas delivery. 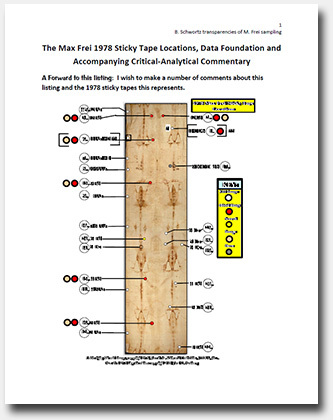 We begin this section on a sad note, with the posthumous publication of the last paper written by our dear friend Paul C. Maloney titled, The Max Frei 1978 Sticky Tape Locations, Data Foundation and Accompanying Critical-Analytical Commentary. As I mentioned in Paul's memorial above, we had been collaborating on a project for more than a year and he sent me this final draft of the paper in the early morning hours of August 27, 2018, the day he passed away. It includes the final version of the map and commentary he had created that accurately documented the source areas on the Shroud where Max Frei took his tape samples in 1978. 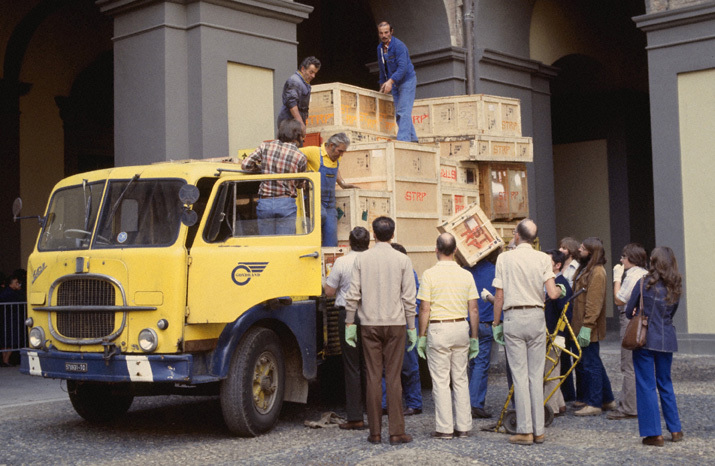 The maps were based in large part on the photo-documentation images I took of Frei collecting his tape samples during the 1978 examination and marks Paul's final contribution to Sindonology. Of course, a number of other papers have been published recently and we are including them here as well. All have also been permanently archived on the Scientific Papers & Articles page (alphabetically by title) and the Website Library page (alphabetically by author). We have always tried to include different language translations of pages, articles or papers whenever they were available. In recent months, a number of people have contacted us and freely offered their services to translate certain articles or pages on the site. We are grateful for their contributions and are including below links to the original articles as well as the new translations. For your information, the above flags are from (l to r) India, Spain, Netherlands and Lithuania and represent the new translations in today's update. Thank you all for your participation! Frequently Asked Questions page of Shroud.com translated into Hindi Language version by Jordan Mendez. (Page also available in Spanish, Polish and Danish languages). Mysteries of the Turin Shroud Revealed - YouTube video (1:23:29) - August 25, 2018 - We start with an interesting video of an excellent, in-depth presentation made by our dear friend and world renowned Shroud scholar, Emanuela Marinelli, at a Family Life International event in August of this year. Emanuela's English may not be perfect, but her extensive knowledge of the Shroud is superb. This video is definitely worth watching. Shroud of Turin Part 1 of 2 - YouTube - Audio Only (47:51) - March 18, 2018 - Last year I appeared on the Radio Maria program "Salvation Is From The Jews," hosted by noted scholar and author Roy Schoeman (who wrote the book of the same title). Roy conducted an in-depth interview with me and published the program on YouTube in time for the Lenten season this year, but I just found out about it myself so I thought I would share it with you here. Note that Roy was born and raised Jewish but converted to Catholicism and views Christianity from a Jewish perspective. Although I always hesitate to include programs I appear on in this section of the update, Roy's popularity and our personal perspectives make this one of the more interesting interviews I have given. This is a link to Shroud of Turin Part 2 of 2 - YouTube - Audio Only (54:08) - March 18, 2018. Only one new Shroud related book was published in recent months. We are listing it here but have also permanently archived it on the Shroud of Turin Booklist page (alphabetically by author). To make it easy to find the new addition, we have annotated its listing with "(Added 8 October 2018)" so you can simply search for that phrase on the Booklist page should you forget the title. "As an artistic medium, photography is uniquely subject to accidents, or disruptions, that can occur in the making of an artwork. Though rarely considered seriously, those accidents can offer fascinating insights about the nature of the medium and how it works. 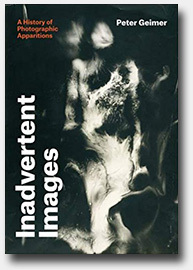 With Inadvertent Images, Peter Geimer explores all kinds of photographic irritation from throughout the history of the medium, as well as accidental images that occur through photo-like means, such as the image of Christ on the Shroud of Turin, brought into high resolution through photography. Geimer's investigations complement the history of photographic images by cataloging a corresponding history of their symptoms, their precarious visibility, and the disruptions threatened by image noise." The internet continues to be a major source of activity and information about the Shroud, with new resources popping up on a regular basis. Of course, it is impossible to keep up with everything that appears, but we try to select and include the most interesting and relevant links for your information. Should you see something online that you believe would be appropriate for this website, send us an e-mail with the link and we'll consider it for a future update. New Shroud Alaska Group - I was recently contacted by Stacey Reiman, who was excited to inform me that a new Shroud group was being formed in Alaska. The organization is being sponsored by an Anglican church and a priest named Father David Terwilliger. The group has already scheduled Dr. Cheryl White as a speaker at their first small Shroud conference in just a few weeks and hope to grow and bring other Shroud speakers to Alaska in the future. If you live in Alaska you might want to contact the group and become a participant. Their contact information is on their website and I am sure they can use all the help they can get. We send the organizers our best wishes for a successful new Shroud group! An Open Letter to Prof. Christopher Ramsey - This is a link to the excellent Shroud of Turin Blogspot by Stephen E. Jones, who has been publishing in installments an open letter he is drafting to Prof. Christopher Ramsey, the current Director of the Oxford Radiocarbon Accelerator Unit (one of the three laboratories that dated the Shroud in 1988). Stephen's letter goes into great detail and documents much of the available evidence, both scientific and historical, that strongly supports an older date than that given by the 1988 dating results. Regular viewers will recognize Stephen as the man who has been graciously doing the extensive scanning and optical character recognition necessary to allow STERA, Inc. to archive every issue of Dorothy Crispino's journal, Shroud Spectrum International, Rex Morgan's journal, Shroud News and the BSTS Newsletter. Great work Stephen! Definitely worth reading. Le Saint Suaire by Giuseppie Enrie - This is a link to a scanned copy of the French language version of the important book written by Giuseppie Enrie, the second man ever to photograph the Shroud. The original book was written in Italian and this is the official French translation by Georges Porsche. The pdf file was scanned and posted on Academia.edu by Francis DeStefano and it can be downloaded if desired. David Goulet - Robust update! However I would like to recommend that, perhaps at next update, you give a nod to Colin Berry's website and ongoing experiments that provide a possible man-made narrative for the Shroud. I know Colin is not the most popular Shroud investigator but his research is compelling. His is, imo, the one non-authentic hypothesis that bears serious consideration. If reason is to serve faith, then we must challenge our assumptions and Colin's site is a place to do that. To ignore the incredible amount of scientific modelling and research he has undertaken would be a disservice to the Shroud. STERA, Inc. - I will certainly consider it for our next update. However, Colin didn't win himself any friends by launching unprovoked ad hominem personal attacks against other researchers (including me) on a regular basis when Dan Porter's blog was still active. Disagreeing with a researcher's conclusions or results is how science advances and is perfectly acceptable, but personal attacks, particularly on deceased researchers who are no longer alive to defend themselves, crosses the line. Sadly, Colin crossed that line regularly. David Goulet - Acknowledged and I appreciate the reticence given his antagonism. My main concern though is that regardless of Colin's demeanor his science modelling continues to be compelling and innovative. There may be aspects of his work that may even provide insights for pro-authentic researchers - for those with the patience to sift through his site and deal with his truculence. STERA, Inc. - Fair enough. May I quote this exchange? You made a convincing argument and I'd like to publish it with the link. David Goulet - Of course. Thx. Shroud of Turin Without All the Hype - This is the link to Colin's web page. I always write this section as I am completing one of our website updates, so I am never really sure when the next update will go online. However, I am certain that the next major update will occur on January 21, 2019 and will mark our 23rd anniversary on the internet! That update will also include the completion of Rex Morgan's Shroud News archive with the addition of the last eight of 118 issues, the latest papers, books, articles and videos and of course, any breaking Shroud news. To be sure you don't miss any important Shroud information as it occurs, check our STERA, Inc. Facebook page from time to time, since we now try and update it every week or so to keep you informed between our regular website updates. You can also join our Website Mailing List and receive an e-mail whenever the site is updated (3 or 4 times per year) or any important Shroud news breaks. We hope you find this update interesting and useful and look forward to seeing you soon! Thank you all again for being there! You are truly appreciated. Sorry for the very long silence, as it has been a full six months since our last website update. In fact, that is the longest we have ever gone without an update in our 22+ year history. 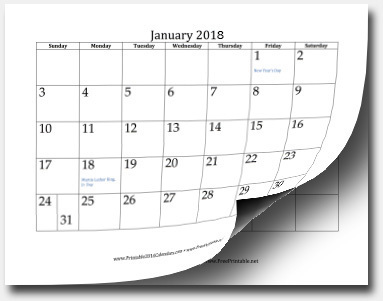 Our major computer crash in January was immediately followed by the busiest travel and lecture schedule I have had in years. Needless to say, that put me far behind in everything, including updating this site, so your patience is appreciated. 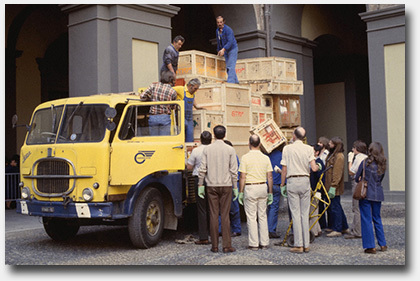 As I mentioned in our last update, this year marks the 40th anniversary of the first ever in-depth scientific examination of the Shroud of Turin by the Shroud of Turin Research Project (STURP) on October 8-13, 1978. In commemoration of that historic event, we will be celebrating the anniversary year with some special materials in each of our regular updates and culminating with a Special STURP Update on October 8, 2018, 40 years to the day that we began our examination of the Shroud in 1978. This update also brings you seven more issues of Rex Morgan's Shroud News, more information on the special youth pilgrimage and Shroud exhibition authorized by Pope Francis for August 2018, announcement of an international conference in 2019, obituaries for several departed Shroud scholars, many new books, papers, articles, videos and much more. There is a huge backlog of material that I have included in this update, so let's get started. The above (never-before published) photograph was taken at the press conference held on Saturday, October 14, 1978, the morning after STURP ended their historic scientific examination of the Shroud and the day the cloth was returned to its reliquary. I think the expressions on everyone's faces indicate there was a feeling of satisfaction and accomplishment amongst all those involved. 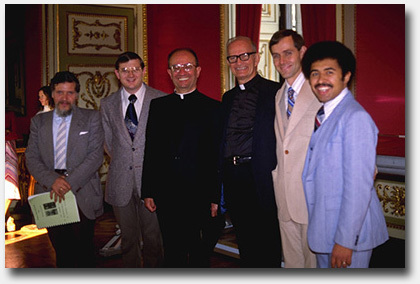 For those who might not know, Prof. Luigi Gonella was the Scientific Advisor to the Archbishop of Turin in 1978 and still held that position ten years later, during the radiocarbon dating of the Shroud. Physicist Eric Jumper, then of the Air Force Academy, was the co-founder of the STURP team. Msgr. Jose Cottino was titled the "Keeper of the Shroud" and held one of the three keys to its reliquary. Fr. Adam Otterbein was President of the Holy Shroud Guild that acted as our liason with Turin and King Umberto. Physicist John Jackson, also from the Air Force Academy, was the co-founder of the STURP team. Ken Stevenson, another member from the Air Force Academy, was the Public Affairs Coordinator for the STURP team. Please note the book that Prof. Gonella is holding, which is a now rare copy of the original STURP Test Plan that was only issued to each team member and certain Turin officials. It was based on this plan that King Umberto authorized our historic 1978 examination of the Shroud. As part of our 40th anniversary celebration we are making the original Test Plan, formally titled, Operations Test Plan For Investigating the Shroud of Turin by Electromagnetic Radiation at Various Wavelengths, available online to everyone for the very first time. I think you will find it enlightening as it clearly demonstrates the thoroughness and care that STURP exhibited in planning their research. It creates a benchmark and provides an example that future Shroud researchers can use to carefully plan their own work. We have permanently archived links to the Test Plan on our Main Menu and 1978 Scientific Examination pages. Watch for more important STURP information in our next update. In our January update in an article titled, Special Shroud Exhibition Approved by Pope Francis, we announced that Pope Francis approved the suggestion by Archbishop Cesare Nosiglia, the Archbishop of Turin, to allow a special exhibition of the Shroud exclusively for the pilgrimage of young people in August 2018. The exhibition will not be open to the general public. Since then, the International Center of Sindonology (CIS) in Turin has provided us with some updated information, including several links to Italian language websites about the event. The first of these is to a Press Conference website titled, "10 Paths for the Pilgrimage of Young People to the Shroud." Below is an online English language translation of the page. For more details, read the article (in Italian) at the above links. You can use an online translation service to translate the page into your native language. There will be ten paths of the pilgrimage of young Piedmontese people in front of the Shroud for the extraordinary veneration of the Sheet, the night of August 10th. They will be the distinctive program with which the Diocese of Turin, together with other Italian ones, are preparing for the embrace with the Pope in Rome, Saturday 11 and Sunday 12 August and, especially at the XV Ordinary General Assembly of the Synod of Bishops, scheduled for October 2018 on the theme "Young people, faith and vocational discernment". An appointment for which they are still mobilizing all the dioceses of the world. The press conference on the streets held on Friday 4 May at the Circolo della Stampa at Palazzo Ceriana in Turin, the headquarters of the Piedmontese Order of Journalists, served to take stock of the stages of approach to the highlights of the initiative: those until August 12th. "In Italy we are preparing a great" sign "that will have the youngsters as the protagonists: the ancient and ever new experience of walking on foot in the territories of our country - explained Don Luca Ramello, head of the Youth Pastoral Office of the Piedmont and Valle d'Aosta - If Rome and the meeting with the Pope certainly represent an always sought after destination of great religious significance, the peculiarity of the itineraries of next August will concern the stages of the paths, which will lead to walking in the cities, countries and in the countryside of our dioceses and parishes, offering a new look at landscapes, architectures and natural settings that are not always known and appreciated. The reappropriation of cultural heritage and natural beauties of our land requires a different way of approaching the reality that surrounds us, a way that pilgrimage on foot allows and propitiates. "The hope is that the paths of next summer can help our young people" descend to Capernaum "(Jn 2.12), in the daily life of a renewed life." The second link the CIS provided is to another Italian language website specifically about the Pilgrimage titled, L'Amore lascia il Segno (Love Leaves the Sign). Below is an online English translation of the page. Again, you can use an online translation service to translate the page into your native language. On the journey of young Italians to the #Synod2018, with the meeting with Pope Francis on 11 and 12 August 2018, the dioceses of Piedmont and Valle d'Aosta invite diocesan pilgrimages to converge at the Royal Palace of Venaria Reale and from there to Turin. On the night of 10 August 2018 an exceptional gift for all pilgrims: the veneration of the Holy Shroud. In the footsteps of the Beloved Disciple to discover that ... Love leaves the Sign! The final link is to another page of the above website (in Italian) that provides Inscriptions and Information (including maps) on the paths that the pilgrimage will take. Our sincere thanks to Paola Cappa, External Relations, International Center of Sindonology, Press office, Museum of the Shroud for providing us with the information. With this update we add seven more issues to Rex Morgan's Shroud News archive, which will total 118 issues when complete. This update includes Issue #94, April 1996 through Issue #100, February 1997, which also happens to be the seventeenth anniversary issue and the largest to date, with more than 80 pages. That leaves only 18 issues remaining until the archive is complete! This group of issues includes contributions by such notables as Ian Dickinson, Rex Morgan, Paul R. Smith, Br. Bruno Bonnet-Eymard, Remi Van Haelst, Ian Wilson, Dr. Alan Whanger, Prof. Daniel Scavone, Dr. Alan D. Adler, Dorothy Crispino, Paul C. Maloney, Dr. Eugenia Nitowski, Joseph Marino, Fr. John Conliss and many more. Our sincerest thanks as always to Stephen Jones for his extraordinary effort in scanning and optical character recognition of every page, Ian Wilson for providing the original issues and valuable input and of course, to Rex Morgan for his gracious permission to reprint them here on Shroud.com. Speaking of newsletters, Paul Maloney contacted me earlier this year about archiving the ASSIST Newsletter here on Shroud.com. For those who are not familiar with Paul or the ASSIST organization, it is formally known as the Association of Scientists and Scholars International for the Shroud of Turin, Ltd. and Paul is one of its founders and General Projects Director. The organization is actually a consortium of groups and individuals dedicated to the scientific research of the Shroud. In fact, ASSIST was the first organization to acquire the important Max Frei Collection. Paul himself is an archaeologist who has dedicated himself to the study of the Shroud for more than 40 years and whose many contributions are highly respected around the world. [Editor's Note: Try typing "Maloney" into the Website Search Engine on Shroud.com and you will get more than 160 results]! As for the Newsletter itself, sadly, for a number of reasons only three issues were ever published. Paul has graciously allowed us to reprint them here and make them available to everyone. I think you will agree that it is a shame more issues weren't published. We have also archived the newsletters on the Website Library page. As many of you know, each year I teach a course titled, "The Shroud of Turin Research Project (STURP): The Team and Their Science" at the Ateneo Pontificio Regina Apostolorum (APRA) in Rome. It is part of a larger curriculum that leads to a Postgraduate Certificate in Shroud Studies. 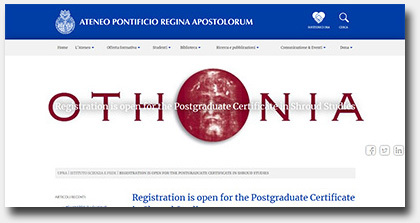 Here is a brief description: "The Science and Faith Institute of the Pontifical Athenaeum Regina Apostolorum, in collaboration with Othonia, the International Center of Sindonology in Turin and the Giulio Ricci Diocesan Center of Sindonology of Rome is offering for the eighth consecutive year a Postgraduate Certificate in Shroud Studies. This program offers a systematic approach to the intellectual challenges posed by the Shroud of Turin, as well as the opportunity to go deeper into the message that it proposes to the faith and to the heart of believers." Historically, I teach my course in English while a translation into Italian was being recorded in real time. My course, among many others, is now available online (in both English and Italian) via the APRA website. Note that the instructors and lecturers for the various courses include Nello Balossino, Bruno Barberis, Gianfranco Berbenni, Antonio Cassanelli, Andrew Dalton, Paolo Di Lazzaro, Roberto Falcinelli, Giuseppe Ghiberti, Ada Grossi, Eamon Kelly, Flavia Manservigi, Alfonso Mu�oz-Cobo, Rafael Pascual, Alfonso S�nchez Hermosilla, Piero Savarino, Barrie Schwortz, Enrico Simonato and Gian Maria Zaccone. Since this is a postgraduate course, certain academic requirements must be met to obtain accreditation, but there is an option to just audit the classes if you prefer. To do so, students are only required to complete the courses and conferences, after which they will receive a certificate of attendance. See the website for additional details and Registration information. 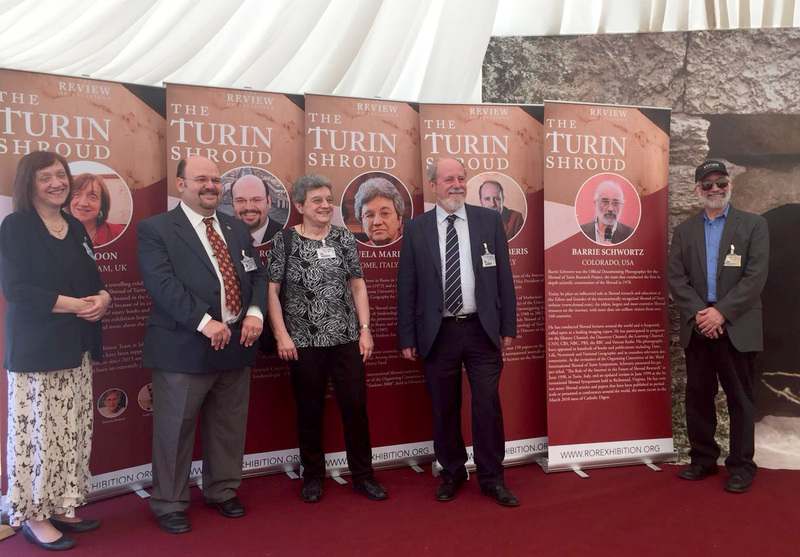 This year, Turin's International Center of Sindonology (CIS) decided to celebrate the annual Feast Day of the Holy Shroud (on May 4th) and also hold their annual meeting (on May 5th and 6th) in the town of Chamb�ry, France, a place that plays an important role in Shroud history. 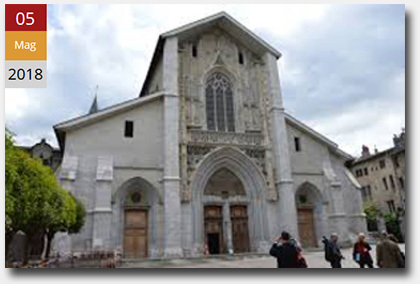 The focus of this year's meeting was radiocarbon dating and the CIS delegates met at the conference hall of the Diocese of Chambery and gave a series of reflections on the dating of the Shroud, thirty years from the results obtained with the Carbon 14 method. Speakers included ENI chemist, Dr. Marco Ricci, who provided the basic elements for understanding the procedure, Dr. Paolo Di Lazzaro, ENEA laser physicist, who focused on the limits of the methodology applied to the samples and Dr. Marco Riani of the University of Parma, with a robust statistical analysis on the 14 C dating by the three laboratories to which the task was officially assigned. As a member of the CIS Scientific Advisory Committee myself, I had hoped to attend the meeting. However, when the dates were announced I realized that I would be in the air and flying to Rome to teach my course at the Ateneo Pontificio Regina Apostolorum on May 5th, the first day of the meeting. Consequently, I was not able to attend so I cannot report on the Chamb�ry event first hand. Instead I will provide you with the best information I have to date and will update this story again as more information becomes available. "Thirty years after the dating of the Shroud with the technique of radiocarbon, new doubts emerge on the reliability of that result, according to which the sheet that bears the image of the body of a man scourged and crucified as Jesus would actually be a fabric dating back to medieval times. It will be discussed at the annual meeting of the scientific committee of the International Center of Sindonology, May 5 and 6 in Chamb�ry, in Savoy, with international physicians, physicists, chemists, historians and biologists. Among these is Paolo Di Lazzaro, research director of the Esnea di Frascati, who in his speech will remember as "the calculation that transforms the number of C-14 atoms in the age of a tissue" present "greater uncertainties compared to other solid samples ( bones, artefacts, etc.) due to the greater permeability of the textile sample to external agents (bacterial digestion, mold, dirt)." 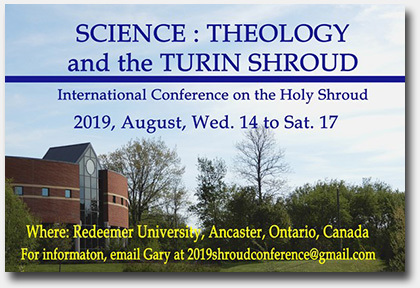 Our good friend Dr. Gary Chiang of Redeemer University in Ancaster, Ontario, Canada, recently announced that he is organizing an international Shroud conference titled, "Science : Theology and the Turin Shroud" to take place on August 14-17, 2019 at his university. Of course, he is still in the planning stages so we don't have all the details, but here is the information Gary provided in the meantime. We will include any new information as soon as it becomes available. "It will be held at Redeemer University, Ancaster, Ontario, Canada, on August 14-17, 2019 and accommodations will be available on-campus. Ancaster is accessible via three airports (Toronto, Hamilton, Buffalo). Tentative cost of registration: $275 participant; $100 spouse; $100 student (Canadian dollars). We hope this price will also include food, and can confirm that the closer we are to the date. It does not include accommodation. Once the contract has been worked out with the university, a web page will be created for registration and accommodation. If you have any questions, contact me at 2019shroudconference@gmail.com. "At this time, it would be helpful if you could indicate your interest in attending and if you would like to give a presentation/talk. Note: the conference includes both the science of the Shroud and its relationship to theology. We also have a special student rate hoping to encourage young academics to become involved. PLEASE SHARE THIS INFORMATION. /s/ Gary Chiang"
There have been many new papers and articles published in the past six months and we are including a number of them here. All have also been permanently archived on the Scientific Papers & Articles page (alphabetically by title) and the Website Library page (alphabetically by author). "The imprint of the feet and lower limbs, as well as the blood and rivulets, present on the Shroud of Turin were analysed with regard to anatomical and pathological characteristics. In the dorsal image of the cloth, the crucifixion position shows the left foot on top of the right one; in the frontal view, the feet are almost parallel. The nail used in the crucifixion was driven through the foot. In the frontal image, the knees, the tibiae and the ankles seem to be parallel with different varus�valgus angles; the left one is straighter than the right one, which shows a greater angle. Because of this parallelism, both ankles show a plantar flexion that is dissimilar in the dorsal images. We describe for the first time the anatomical study of the image of the Shroud through modern concepts. At the level of biomechanics and anatomy, the image on the Shroud of Turin does not comply with modern knowledge; in fact, the image fails with regard to some aspects that we cannot interpret yet." "...Prior to its placement in the cathedral, the Knights Templars had possession of the shroud and kept it folded in a wooden container with a viewing window, so that the face of the Man in the Shroud was visible as an object of wor�ship for them. (They were, after all, the Poor Knights of Christ and the Temple of Solomon.) The viewing window was framed with wooden latticework. This is based on the research of Frank Tribbe, whose book The Holy Grail Mys�tery Solved (Galde Press, 2003) builds on the work of Noel Currer-Briggs� The Holy Grail and the Shroud of Christ..."
This is an Addendum to the paper Roger presented at the 2014 St. Louis Conference, Shroud of Turin: The Controversial Intersection of Faith and Science, and brings his earlier work up to date. "...The Association of Scientists and Scholars International for the Shroud of Turin (ASSIST) recently launched a new initiative to determine if limestone particles found on the Shroud originated from a Jerusalem tomb or if the limestone came from another locale. This initiative supplements a similar test performed in the 1980�s by optical crystallographer Joseph Kohlbeck, which indicated that there were indeed particles of Jerusalem limestone on the Shroud. If the limestone and pollen particles originated from Jerusalem, the possibility that the Shroud did once envelope the crucified body of Jesus of Nazareth would be significantly enhanced. ASSIST team member Paul Maloney contacted Dr. Bryant Wood, ABR Director of Research, for help in obtaining samples from a tomb complex beneath �cole Biblique, beside the famous Garden Tomb in east Jerusalem. With detailed collection protocols from ASSIST, Dr. Wood, Dr. Scott Stripling, Abigail Leavitt, and Kent Wegner, all in Jerusalem for the final excavation at Khirbet el-Maqatir in December 2016 and January 2017, went to work...."
This is a link to a new German language translation by Philip Egger of an original 1998 paper by Shroud scholar Jack Markwardt titled, The Fire and the Portrait, which was first presented at the 1998 Shroud Symposium in Turin. The Fire and the Portrait by Jack Markwardt - From the 1998 Turin Symposium. (Russian language). This is a Russian language translation of the same article. O Shroud De Turin: Parabela Para Tempos Modernos? (The Shroud of Turin: A Parable for Modern Times?) by Thaddeus J. Trenn - Reprinted from the JOURNAL OF INTERDISCIPLINARY STUDIES - Vol. IX - No. 1/2 1997 (Portuguese language) - Portuguese language translation by Artur Weber for https://www.homeyou.com/~edu/. This is a link to a new Portuguese language translation by Artur Weber of an original 1997 paper by Shroud scholar Thaddeus J. Trenn titled, The Shroud of Turin: A Parable for Modern Times? The original article and this translation are archived on the Religion and Philosophy page. Kapes - Shroud of Turin - Hip-Hop Video on YouTube (2:32) - April 19, 2018 - I had been corresponding with Stephen Inglis (aka Kapes) in England for about a year before he mentioned that he was a hip-hop/rap artist and sent me a link to his Shroud of Turin YouTube video. I had to smile when he stated, "I'm guessing rap music may not be your cup of tea but I am using it as a tool to create awareness amongst this younger generation. Please take look and let me know what you think." Actually, I was exposed to rap music when I lived in Los Angeles and actually knew several very successful rap artists personally. As soon as I played it I knew I would include it here on the website. Although I know many of our website viewers are not fans of this particular music form, I wholeheartedly agree with Kapes that this is a great way to expose the younger generation to the Shroud and I am truly grateful for his contribution. Thanks for sharing this with us Kapes! [Hint: the message is in the lyrics]. Pass this on to your kids or grandkids if it isn't your cup of tea. Fishing With Dynamite Podcast - Barrie and the Shroud of Turin - mp3 Audio (37:46) - March 21, 2018 - While lecturing in Charles Town, West Virginia, in March of this year I took part in a rather lighthearted podcast called "Fishing With Dynamite," hosted by two rather lighthearted young men, Mark Guiney and Paul Buede. There is a good bit of humor that runs through the program, which I am sure really appeals to younger audiences, but there is plenty of serious material as well. Frankly, I have to admit it was a lot of fun and different than most that I do so I thought I would share it with you here. You might also want to check out the Fishing With Dynamite website. Who Is the Man of the Shroud Podcast - Episode 1: An Introduction - Fr. Peter Mangum and Dr. Cheryl White - mp3 audio (10:32) - February 16, 2018 - This is a new podcast series dedicated to the ongoing examination and exploration of the mysteries of the Shroud of Turin and brought to you by Shroud scholars Fr. Peter Mangum of the Cathedral of St. John Berchmans in Shreveport, and Dr. Cheryl White, history professor at Louisiana State University-Shreveport. Both Fr. Mangum and Dr. White are members of the American Confraternity of the Holy Shroud � the only authorized affiliate of the Archconfraternity of Turin, curators of the Shroud since 1597. They have both trained at the Shroud Center of Colorado with the noted Dr. John Jackson, who headed the 1978 Shroud of Turin Research Project. 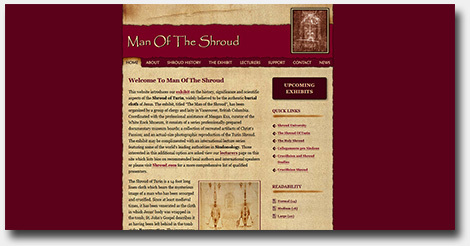 You can find all of the previous programs archived on the Who Is the Man of the Shroud website. 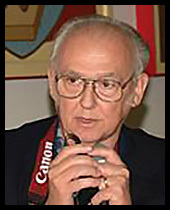 Episode 6B - Guest Episode with Shroud Photographer and Scholar Barrie Schwortz - mp3 audio (38:58) - March 27, 2018 - I was honored to be invited to participate in the podcast while I was lecturing at St. John Berchmans in Shreveport earlier this year. And here is a link to one of my Shreveport presentations: 40 Years of Shroud Science - A Personal Perspective by Barrie Schwortz - YouTube video (2:09:17) - March 20, 2018. Why the Shroud of Turin is Not a Medieval Forgery - Comparison to Other Items With Known Dates by Jonathan Prather - YouTube video of PowerPoint Presentation (10:59) - November 13, 2017 - A presentation by Dr. Jonathan Prather based on the research of the late Dr. Alan Whanger. Here is an excerpt from the author's comments: "Controversy remains about the Shroud's validity and age. Incorrect carbon dating placed its origin in the Medieval period, but the preponderance of evidence indicates that the Shroud is authentic and about 2,000 years old. Its age can be determined by matching Shroud images to other historical objects where the dating is already known, such as paintings, coins, and another cloth (the Sudarium of Oviedo)." CSI Jerusalem: A Physician Looks at the Crucifixion - Charles J. Dietzen, M.D. - YouTube Video (51:43) - October 24, 2017 - This is a great presentation by my dear friend Dr. Chuck Dietzen in Indianapolis, Indiana, a pediatric rehabilitation specialist who brings his medical expertise to the study of the Crucifixion and the Shroud in a dramatic and captivating style. Chuck was in part responsible for the Shroud of Turin Exhibit at the Children's Museum of Indianapolis several years ago (he donated one of our lifesize replicas to the museum for the exhibit) and has brought me to Indiana to lecture with him on many occasions over the past ten years. I am pleased to make one of his presentations available to everyone. Shroud of Turin enhanced face by Znobyrd - YouTube Video (0:29) - February 6, 2011 - Artistic digital interpretation and enhancement of the Shroud face. - "Original image obtained with permission from 'Orates2008' video "The Man in the Shroud". Removed scratches, cleaned and clarified face, hair, and crown of thorns. This is how He might have appeared." - Our thanks to John Donahue for calling this older but very interesting video to our attention. Several new Shroud related books have been published in recent months. We are listing them here but have also permanently archived them on the Shroud of Turin Booklist page (alphabetically by author). To make it easy to find the new additions, we have annotated each new listing with "(Added 21 June 2018)" so simply search for that phrase on the Booklist page. 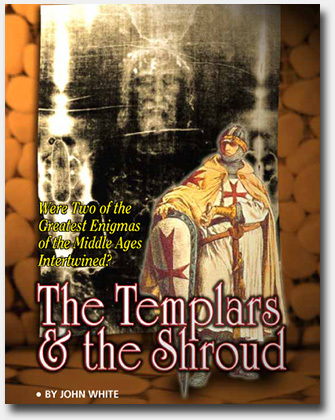 "Behind this slightly provocative title lurks a rigorous historical study on the Turin Shroud and its ancient history. Taking as starting point the legend of King Abgar who allegedly received one of the 70 apostles of Jesus the shroud which was printed his holy face, this study takes stock of the various "churches" of the first centuries, and the evolution of this legend in the area of Edessa and Constantinople to the Fourth crusade... 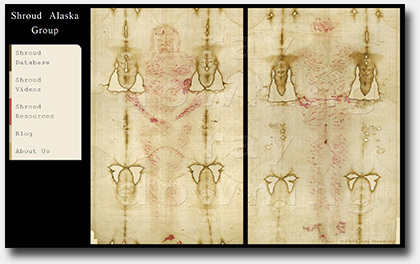 The shroud of Jesus in the Shroud of Turin? Christ relics, the theological battles of the early days of the church, to the story of the pilgrims on the fabulous treasures of Constantinople, discover through an exciting and extremely searched text if the Shroud of Turin can be described as the fifth Gospel, that of the Passion!" "Jesus Christ is arguably the most famous man who ever lived. His image adorns countless churches, icons, and paintings. He is the subject of millions of statues, sculptures, devotional objects and works of art. Everyone can conjure an image of Jesus: usually as a handsome, white man with flowing locks and pristine linen robes. But what did Jesus really look like? Is our popular image of Jesus overly westernized and untrue to historical reality? This question continues to fascinate. 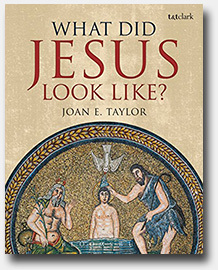 Leading Christian Origins scholar Joan E. Taylor surveys the historical evidence, and the prevalent image of Jesus in art and culture, to suggest an entirely different vision of this most famous of men." 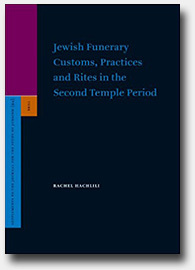 "Research of burials constitutes one of the main reliable sources of information related to various aspects of funerary practices and rituals, and offers a perception of ancient social life and community organization... Though the funerary rites changed from inhumation in coffins and loculi to secondary burial by collecting bones in ossuaries the artifacts associated with these graves did not modify much and indicate that these were culturally and socially identical people. The study outlines the material preserved in the ancient Jewish cemeteries of the Second Temple period (first century BCE to first century CE) at Jerusalem, Jericho, 'En Gedi, Qumran and some other tomb sites." Over the past six months a large number of news articles and web pages have featured the Shroud of Turin on the internet. Of course, this is not unusual, particularly during the Lenten season when the Shroud is often a topic of conversation. We have chosen and are including a selection of them here but there are just too many to include them all, so we are sorry if we missed any of your favorites. [Editor's Note: If you know of a website or article that should be included here on Shroud.com, just send us the link and we'll include it in our next update]. In the end, we think you will find many of them interesting. Enjoy! 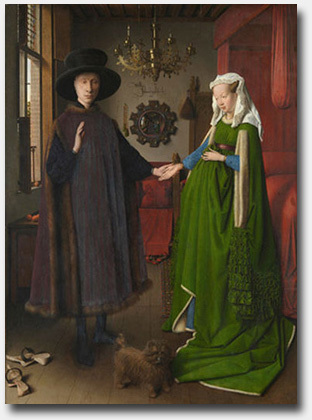 The Turin Shroud... the hidden inspiration for Jan Van Eyck�s Arnolfini Portrait by Bernard Gallagher - April 1, 2018 - The author of this website makes some interesting claims. He reveals how the Shroud and the illustrations from the Pray Codex form the framework for Jan van Eyck's famous painting in the National Gallery, the Arnolfini Portrait (1434). The article is filled with high quality images and clearly presents the author's evidence and conclusions so you can review his work and decide for yourself. Here is a brief excerpt from the article: "The discovery relates to the linen burial cloth known as the Turin Shroud, and two illustrations depicting the deposition and resurrection of Jesus that appear in the Pray Codex, a Hungarian manuscript produced between 1192 and 1195." Shroud of Turin Unveiled for Youth in Documentary by Joseph Pronechen - National Catholic Register, March 26, 2018 - The story of The Holy Winding Sheet, a Shroud-related documentary film by Chuck Neff (available on DVD). Here is an excerpt from the article: "It�s fascinated scientists, but in a world where religious practice is disappearing, especially among the young � nearly four in 10 (39%) young adults (ages 18-29) claim no religious identity, according to a 2016 study by the Public Religion Research Institute � one high-school senior took up a serious inquiry into evidence of the Crucified Christ when he interrogated the four leading specialists on the Shroud of Turin, a linen cloth bearing the image of a man believed to be Jesus Christ." Shroud of Turin's 3D Encoded Info - How'd It Get There? by Myra Adams - WND.com, March 22, 2018 - Here's an excerpt: "To help us explain this unusual Shroud characteristic is Ray Downing, an Emmy award-winning graphic artist. Downing is known for incorporating the Shroud�s 3D distance information into life-like images of Jesus. Millions saw his work on the History Channel�s popular documentary called �The Real Face of Jesus?� that aired every Easter season from 2010 through 2016. Then in 2017, it was updated and re-named, �The Face of Jesus Uncovered?� Myra, who has written extensively on the Shroud and believes in its authenticity, interviewed Ray Downing for this article. Blood on the Shroud: An Interview with the Blood Investigator of the Shroud of Turin Research Project by Peter J. Shield - Ancient Origins, March 6, 2018 - This is a fully illustrated article by Dr. Peter J. 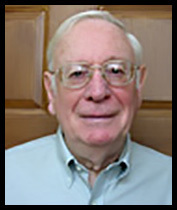 Shield, who interviewed the late Dr. Alan Adler, the blood expert on the STURP team, for his radio program in 1987. This article is a transcript of that interview. Experts Date Jerusalem Tomb by Tim Collins - Daily Mail.com, November 28, 2017 - Interesting article about the dating of the tomb in the Church of the Holy Sepulchre in Jerusalem. Here is the article's headline: "Age of 'Christ's tomb' is revealed: Mortar used in the complex dates to Rome's first Christian emperor suggesting it really IS where 'Jesus was buried and resurrected'." It's official! Our dear friend Dcn. 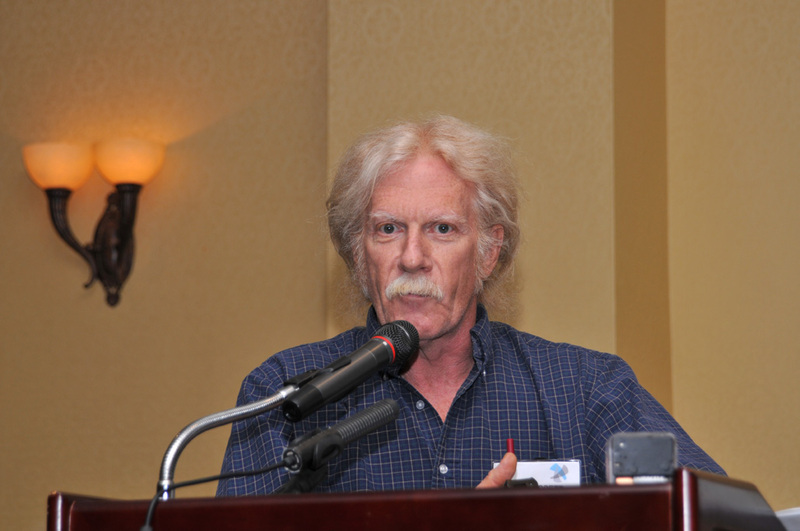 Pete Schumacher, founder of the non-profit Shoud Exhibit And Museum (SEAM) organization in Alamogordo, New Mexico, and probably best known in Shroud circles as the "VP-8 Image Analyzer Expert," has officially retired from the Board of Directors and as President of the SEAM organization. His position is now being filled by Dcn. Andy Weiss, who has worked with Pete almost from the beginning. Pete's retirement was effective January 1, 2018 but he is still available as an advisor when needed and is still happy to make Shroud presentations when asked. Pete remains active in Shroud work and recently restored a vintage VP-8 Image Analyzer to working condition for a new Shroud museum that will be opening soon in the Smoky Mountains. Of course, knowing Pete as I do, I doubt that he will ever completely retire from the Shroud world, in which he has made such important contributions. Congratulations Pete! Enjoy your "retirement!" Typically, when someone of importance or notoriety in the Shroud world passes away, we publish an in-depth memorial to honor their memory and their contributions to Sindonology. Since our January update, I received word of the passing of several important people that fall into that category. Sadly, so much time has passed since some of their deaths that a full memorial would be somewhat awkward and untimely, so we are simply listing them here with a brief summary of their contributions. We extend our deepest sympathies and condolences to the familes and friends of those who passed. "...He became a key participant in the research of the Shroud of Turin. Using his skills in analytical chemistry and research, he became internationally known as a speaker and researcher in the study of the Shroud. One of his greatest achievements was helping to indicate the seeming inconsistency of the carbon dating of the Shroud, with the cloth, when it was determined the sample of the threads tested came from patches sewn into the Shroud after a fire had damaged the cloth. Those samples tested were found to be not from the actual burial cloth." "A Rosary Vigil was held Thursday, March 15, at 7pm at Immaculate Heart of Mary Parish in Los Alamos. The funeral was held at IHM on Friday, March 16 at 10am. Interment followed at Guaje Pines Cemetery in Los Alamos, followed by a reception luncheon at the IHM Parish Hall." Here is a link to Ed's formal obituary: Edward O'Brien Desloge. "...In January Joe Marino emailed me that he had been informed by Piero Iacazio that Prof. Franco Testore had died on 14 January 2018. The following is my brief obituary of Prof. Testore. 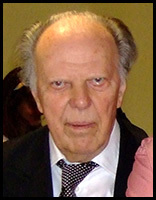 Dr Franco A. Testore was a professor at the Polytechnic University of Turin and Director of that university's Textile Department. 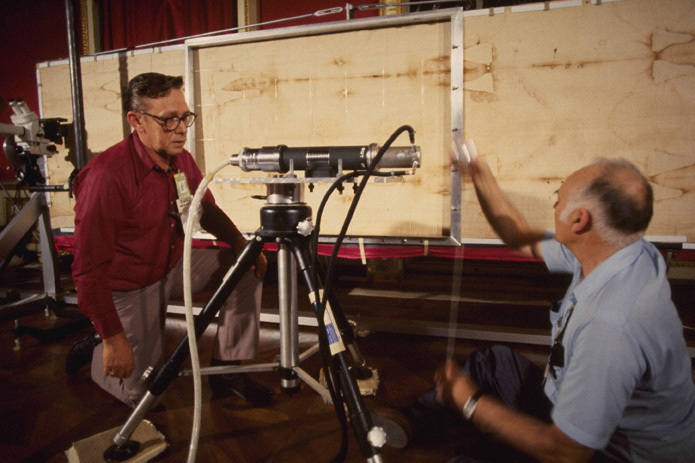 Testore and Gabriel Vial were the two textile experts invited to observe the cutting of the Shroud sample for radiocarbon dating on 21 April 1988. They were seeing the Shroud for the first time and Testore (not unreasonably although it has been ridiculed by anti-authenticists Sox and Gove), pointed to the bloodstain of the spear wound in the side and asked: "What's that large brown patch?" 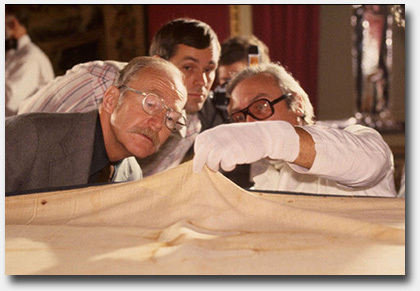 Turin microanalyst Prof. Giovanni Riggi di Numana (1935-2008) and Testore, selected the area of the Shroud to be cut. Testore then weighed the sample cut from the Shroud, and also the three subsamples cut and distributed to the three radiocarbon dating laboratories: Arizona, Zurich and Oxford." On March 2, 2018, highly respected Italian archaeologist, historian, researcher and writer, Maria Grazia Siliato, passed away at age 91. She was a delegate for Italy of the C.I.E.L.T. 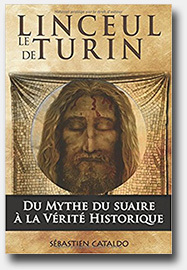 (Centre International d�Etudes sur le Linceul de Turin) of Paris (France), and the author of many noted books, including Masada, Sindone, Caligula and several other books about the Shroud. She was well known for her brilliant presentations at Shroud conferences. I usually don't know the exact date for our next website update while I'm still working on the current one, but this time is different. As you know, we are focusing on the STURP team this year, as 2018 marks the 40th anniversary of their historic examination of the Shroud in 1978. With that in mind, the next update will go online on October 8, 2018, forty years to the day after we began our examination of the Shroud in the Royal Palace of Turin. That update will focus mainly on STURP and will include some very important but never-before-available-online materials that Shroud scholars should find very useful. So enjoy this (huge) update, which should keep you busy for quite a while! Have a great summer and we'll see you in the fall. Today, January 21, 2018, marks our 22nd anniversary on the internet! However, even more important is the fact that this year also marks the 40th anniversary of the first ever in-depth scientific examination of the Shroud of Turin by the Shroud of Turin Research Project (STURP) on October 8-13, 1978. In commemoration of that historic event, we will be celebrating the anniversary year with some special materials in each of our regular updates and culminating with a Special STURP Update on October 8, 2018, 40 years to the day that we began our examination of the Shroud in 1978. This update also brings you nine more issues of Rex Morgan's Shroud News, word of a special youth Shroud exhibition approved by Pope Francis in August 2018, memorials for several departed Shroud scholars and much more. However, we experienced a major computer crash just a few days ago, so many of the materials (books, papers, articles and videos) that I had hoped to include in this update will have to wait until a later update after our computer issues are resolved. Your patience is appreciated. It is hard for me to believe that 40 years have gone by since our team was given the unprecedented privilege to perform an in-depth scientific examination of the Shroud of Turin in 1978. Of course, it also brings with it the sadness of knowing that so many of our team members have passed away in the ensuing years. In fact, ten years ago, to celebrate our 30th anniversary, I created a special tribute video that was shown at the 2008 Columbus, Ohio Shroud Conference. Even sadder, since I produced that video, several more team members have passed, so their names are not included in the memorial at the end of the tribute. Those not included are Vernon Miller, Don Devan and Bill Mottern. I thought a good way to start this 40th anniversary year would be to re-release the video and share it with our current viewers. Here is the link to A Tribute to the STURP Team - 1978-2008, which runs just under 15 minutes. Watch for more important STURP information in every future update this year. President of the Diocesan Commission for the Shroud, and Fr. Luca Ramello, head of Youth Ministry. 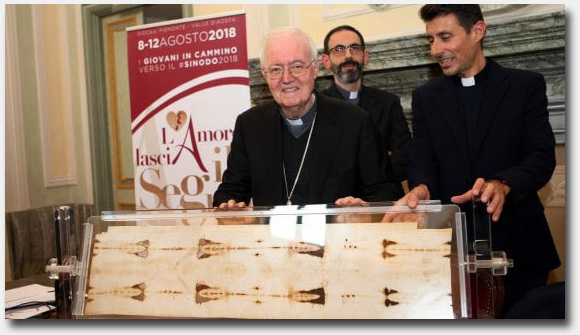 On November 21, 2017, it was announced that Pope Francis approved the suggestion by Archbishop Cesare Nosiglia, the Archbishop of Turin, to allow a special exhibition of the Shroud exclusively for the pilgrimage of young people in August 2018. On August 9 and 10, young people from the 17 dioceses of Piedmont and Valle d'Aosta will arrive in Turin. In the afternoon and evening of the 10th they will have the opportunity to visit the Shroud and then continue on to Rome. The exhibition will not be open to the general public. For more details, read the article (in Italian) at the above link. You can use an online translation service to translate the page into your native language. It is with the deepest sadness that I must report the passing of our dear friend and colleague, Diana Andry Fulbright, 75, on November 24, 2017, peacefully in her sleep at her home near Richmond, Virginia. Our sincerest thanks to Bryan Walsh for informing us the next morning. Diana was a Founding Board Member of STERA, Inc., did all the research necessary for us to start a non-profit and actually helped me form our organization in 2009. Since then, I have relied on her good judgment and valuable input on a regular basis. 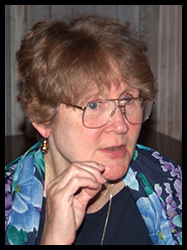 She was my resident Biblical expert and advised me whenever I had questions about either Old or New Testament issues, all of which were far from my own areas of expertise. More than that however, she was a dear friend and supporter of our work. Her passing leaves a void that will not be easily filled and she will be sorely missed by all that knew her. Here is a link to her Official Obituary in the Richmond Times-Dispatch. Our sincerest condolences to Diana's family, friends and colleagues for their loss. Rest in peace dear friend. At the news of Diana's passing, we received an outpouring of comments and condolences from many noted Shroud scholars and researchers around the world who knew Diana and wanted to share their stories and comments with us. There were so many that we have compiled them all into a separate document which we are including here: Diana Fulbright Memorial. 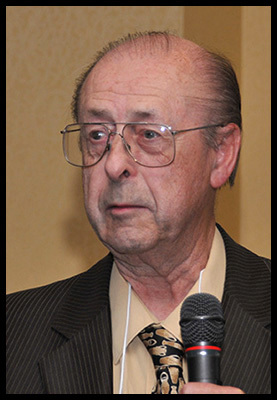 I must also sadly report the passing of long time Shroud scholar and researcher Dr. Alan D. Whanger, 87, of Durham, North Carolina, at the Duke University Medical Center on October 21, 2017, after a brief illness. He is survived by Mary Whanger, his wife of 63 years and a noted Shroud scholar in her own right. 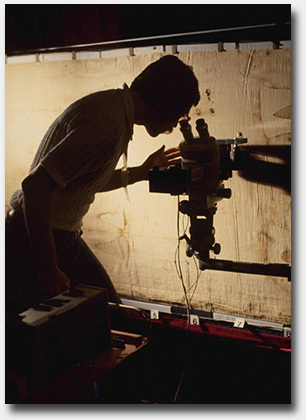 He was best known for applying a polarized light overlay technique to compare the Shroud image to images on ancient artworks and coins. He was a true gentleman and held his colleagues in high regard, even when they disagreed with some of his more controversial conclusions. Our deepest condolences to his family, friends and colleagues. Here is a link to his Official Obituary. Rest in peace my friend. "As a surviving member of the "Turin Shroud Crowd" of the same generation as Alan Whanger I had the pleasure and privilege of knowing him over a period of nearly forty years. I visited Alan's home in Durham on a number of occasions where we discussed and studied his Shroud related research in his impressive basement studio filled with Shroud materials. On one occasion when I was in Jerusalem with the ESSJ expedition Alan tracked me down and asked me to conduct botanical experiments on his behalf with flowers in a tomb complex. I also sourced for him the mighty botanical encyclopaedia of the Middle East. Alan was always a popular personality at the many international Shroud conferences we attended and addressed over the years in many different countries. I always thought of Alan as a Boy Scout as he carried in his breast pocket every conceivable item for emergency use such as a flashlight, laser pointer, tweezers, cutters and numerous writing instruments. On one occasion in France the power went off in the middle of an important address and quick as a flash Alan was on the stage beside the speaker illuminating the notes with his boy scout torch. Some of Alan's work was subject to criticism from the cynics but he made an enormous contribution to Shroud studies so ably assisted by his wife Mary. His work with photographic overlays which he invented contributed considerably to some of my own research on portraits of Christ. Amongst other important collaborations were his work with Scheurrnan, Filas, Danin, Moroni and ASSIST to mention a few. Alan was of the generation of researchers now difficult to replace. My condolences are expressed to Mary and Alan's family as we give thanks for a full life the influence of which has affected a large number of people." "A long friendship linked me to Alan Whanger. His enthusiasm and his generosity in financing new research on the Shroud are known to all. He also cultivated a sincere friendship with those who, like me, did not share all his conclusions. His disappearance is a great loss for Sindonology. He will follow us from heaven!" Alan Whanger was my mentor, friend and inspiration to pursue my doctoral degree with his educational, emotional and spiritual support. Thank you! Finally, I must sadly report the passing of my good friend, noted educator, lecturer and Shroud scholar, Remi G. Dubuque, 82, of Southington, Connecticut, on December 14, 2017. Our thanks to Remi's friend, Daniel Valente, for kindly letting us know of Remi's passing. An ardent student of the Shroud for many years, Remi and I became good friends by telephone and e-mail although we never met in person. His name may not be as well known as some other Shroud scholars, but his influence on those who knew him or heard his lectures was very moving and powerful. Here is a link to his Official Obituary in the Hartford Courant. We extend our deepest condolences to his family, friends and colleagues. Rest in peace Remi. "God's peace and blessings be with you and yours. Remi Dubuque and I were good friends for many years. Remi passed away last Thursday. He was a dear friend and mentor who had given me almost his entire library of Shroud books. What a help those are! He spoke very highly and affectionately of you. Remi loved sharing new information about the Shroud. Not only did he open my eyes to the Shroud's authenticity, he emulated what it means to be a true disciple of the man on the Shroud. Tomorrow I will serve at his funeral Mass. 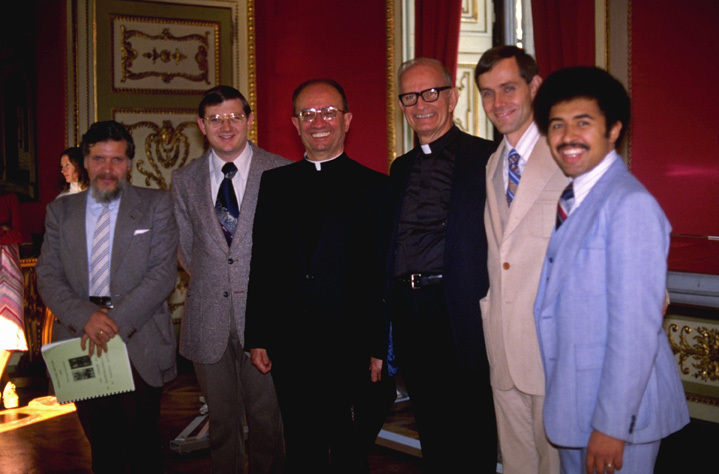 He was a great supporter of my studies for the priesthood and pursuing religious life. My prayers will be for him, for his lovely wife Mary, and all of us who were blessed to call Remi our friend. Peace and prayers..."
First, I want to extend a sincere "thank you" to all of our friends and supporters who made contributions to STERA, Inc. during our recent fundraising campaign. Your generosity, friendship and continued support are truly needed and deeply appreciated! STERA, Inc. held their second 2017 Board of Directors meeting on Sunday, December 17, 2017 via conference call. Due to the holiday season, the meeting was limited to just one important topic. Because of the sudden and unexpected passing of our fellow Board member, Diana Fulbright, the Board had to approve someone as her replacement. I proposed Kelly Kearse as an excellent candidate for this position, as he has a superb background in science, particularly in blood and DNA analyses, and is also a thoughtful and careful researcher whose work has appeared on this website numerous times. I am pleased to announce that the Board approved his selection unanimously and Kelly is now the newest member of the STERA, Inc. Board of Directors. Congratulations Kelly! We look forward to a long and fruitful relationship. With this update we add nine more issues to Rex Morgan's Shroud News archive, which will total 118 issues when complete. This update includes Issue #85, October 1994 through Issue #93, February 1996 with articles by such notables as Orazio Petrosillo, Harry Gove, Revd Albert R. Dreisbach, Jr., John Schulte, Remi Van Haelst, Michael Minor, Dmitri Kouznetsov, Prof. Daniel Scavone, Denis Mannix, Fr Charles Foley and many more. Our sincerest thanks as always to Stephen Jones for his extraordinary effort in scanning and optical character recognition of every page, Ian Wilson for providing the original issues and valuable input and of course, to Rex Morgan for his gracious permission to reprint them here on Shroud.com. As we reported in our October 2017 update, long time British Society for the Turin Shroud (BSTS) member David Rolfe has taken the reins as the new editor of the BSTS Newsletter. David's intention, subject to maintaining subscription levels, is to continue with the printed edition of the Newsletter, which will remain available to its subscribers who will also have access to a new BSTS online forum. This will feature comments from subscribers who may wish to take up any particular issue with the Newsletters's authors, contributors and reviewers. 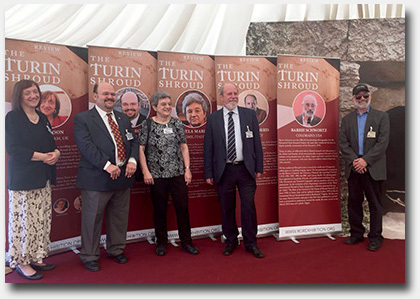 Each new edition will continue to be archived here on Shroud.com at some point in the future so that the whole collection of issues going back nearly 35 years can be readily searched online via our British Society for the Turin Shroud page. You can take out or renew your subscription at this link: www.bstsnewsletter.com. New subscribers joining from January 1st to February 28th 2018 will receive the December issue free of charge. The first edition includes, among other things, the first published fruits of Ian Wilson's extended research into the de Charney family and the first expositions in Lirey. He believes it will lead to some revisions to some long established assumptions. There is also a review by Hugh Farey of the new comprehensive publication from John Jackson, a new article from Paolo di Lazzaro and also an article from Arif Khan, who has curated the Ahmadiyya Community's Shroud exhibition and conference in the UK for the last three years and brings an Islamic perspective to the subject. The BSTS has a proud history and we hope as many of you as possible will continue to support it. UPDATE: Due to our computer crash before the January 21st update, I inadvertantly failed to include the following information: David Rolfe is giving our viewers a special opportunity to view the current issue for free by using this generic password: 99896. This will remain available until the June issue is published, so take this opportunity to check out David's first issue as Editor. Definitely worth a subscription! 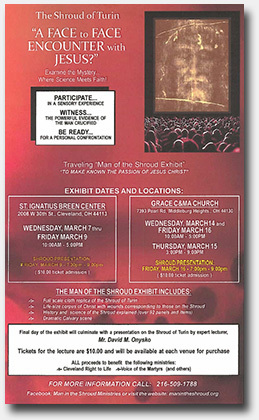 Our good friend, Shroud scholar and lecturer David Onysko, has organized an event titled The Shroud of Turin: A Face to Face Encounter with Jesus?, which will include the traveling "Man of the Shroud Exhibit" (not the exhibit with the same name that tours Canada annually) and will take place at two different venues in Ohio in March 2018. The first event takes place on Wednesday, March 7 through Friday, March 9, 2018 at St. Ignatius Breen Center, 2008 W. 30th St., Cleveland, OH 44113. The second event is scheduled for Wednesday, March 14 through Friday, March 16, 2018 at Grace C&MA Church, 7393 Pearl Road, Middleburg Heights, OH 44130. David will make a presentation on the closing day of each exhibit for which there will be a $10.00 charge, but all proceeds will go to several charities. Click on the above image to see a larger version of the poster with additional details. "As an original team member of STURP (The Shroud of Turin Research Project, Inc.) who were given the rare opportunity to intricately examine and test the shroud, Dr. Kenneth Stevenson brings forth his fourth treatise on the subject with intriguing new perspective. 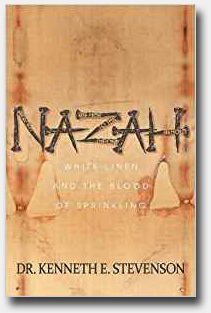 NAZAH offers an outlook on the Shroud of Turin that looks at both the vast amount of clear, scientific research and evidence, and the heart of the Holy Scriptures. Joined with historical fact, prophetic confirmation, Judaic burial customs and personal reflection, the mystery of the shroud of a crucified Jewish man, whose image was left to be seen, is now brought forth to inspire and challenge a new generation of truth seekers. With additional discussions of the relic's historical and spiritual significance, NAZAH will touch the hearts of not only those of Jewish faith, but the hearts of people of all faiths who seek deeper meaning as to what the Shroud of Turin means to today's generation." 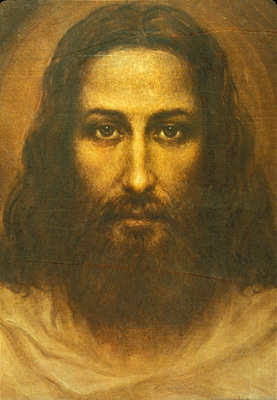 In the last half of the 20th century, the best known artistic interpretation of Jesus based on the Shroud image was the famous 1935 painting by Ariel Agemian. This has changed over the past few decades because of the dramatic advances in digital imaging technologies and computer power. One of the best examples of this was the 2010 computer artistry of Ray Downing, whose digital re-creation of Jesus based on the Shroud was documented in "The Real Face of Jesus" program that appeared on the History Channel. In the past few years, digital artists around the world have been able to render their own interpretations of how Jesus may have appeared based on the Shroud and these show up from time to time on the internet. 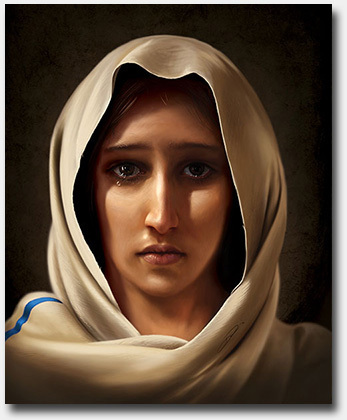 However, throughout all those years, not one artist has attempted to create an interpretation of what Mary, Mother of Jesus looked like based on the Shroud image. Until now, that is. 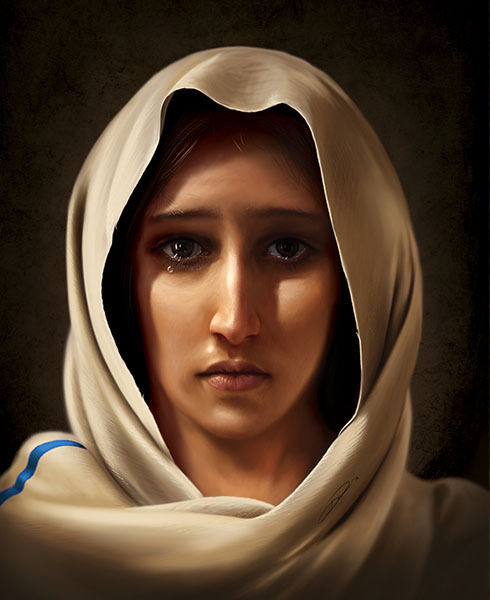 In July of 2017 my good friends Bill and Belenna Lauto directed me to the website of digital artist Dean Packwood in Taupo, New Zealand and shared his beautiful, photorealistic rendition of Mary, Mother of Jesus with me. Dean chose the Shroud of Turin image as the structural basis for his truly beautiful, completely digital artwork and I wanted to share it with you. So I sent Dean a request for permission to include his painting here on our website and he graciously agreed to share it with us. What is most exciting to watch is the time-lapse video (3:21) found on Dean's website (and on YouTube) where you can watch the amazing creation of the image, beginning with a photograph of the Shroud and ending with the Portrait of Mary! (Check it out). Thank you Dean! 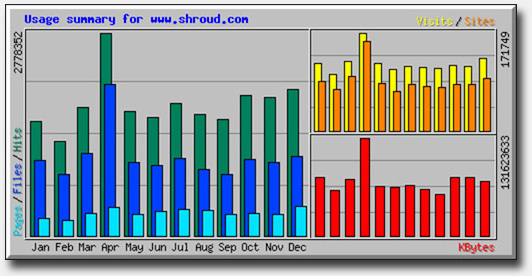 2017 was a banner year for Shroud.com web traffic, surpassing our 2016 total by more than half a million visits and setting a record high for visits in a year when the Shroud was NOT on public display! Of course, when the Shroud is on public display it garners considerable media attention, which drives lots of extra traffic to our site. In 2017 we averaged more than 3900 visitors per day or around 119,000 visitors per month. Our visitors generated over 21 million hits, viewed nearly 13 million files and 3.8 million pages and generated over 895 GB of bandwidth! You can see the details for yourself by clicking on the above graphic. We thank you, our loyal viewers, for your continued participation and support! I am again including my upcoming 2018 lecture schedule in case I happen to be in your area. If so, please drop by and say hello. Also, please understand that as of this writing, the schedule is by no means complete. There are still several additonal lectures being considered so the schedule will inevitably grow. Also, many of the times and venues are still not finalized and subject to change. I will do my best to update them prior to the events. February 21 - 22, 2018 - I will again be speaking at the University Series�, an annual multi-parish adult education program held in Southern California each year during the Lenten season. This year, the University Series�, an event created and organized by my dear friend Fr. Dave Heney, has expanded to include 145 seminars in both Ventura County, where the series originated, and now in the Whittier area as well. The series connects faith with real life in areas such as current events, contemporary moral issues, evangelization, faith and science, marriage and family, church history, scripture and prayer. The 2018 season runs from February 15 to March 23 at thirteen different parishes in Los Angeles and Ventura counties and three parishes in the Whittier area. I will make my first presentation on Wednesday, February 21st at 7:30-9:00 pm at the Beatitudes of Our Lord Catholic Church, 13013 Stanta Gertrudes Ave., La Mirada, CA 90638. I make my second presentation on Thursday, February 22nd at 7:30-9:00 pm at Sacred Heart Catholic Church, 10800 Henderson Rd., Ventura, CA 93004. If you wish to learn more you can visit the University Series Website where you can review each topic and sign up for the sessions. Courses cost $5 per person to attend, but you can bring a friend for free! March 4 - 5, 2018 - I will be lecturing at St. James Catholic Church, 49 Crosswinds Dr, Charles Town, WV 25414. I will make an evening presentation at the Church on Sunday, March 4th, and this is the only event which will be open to the public. 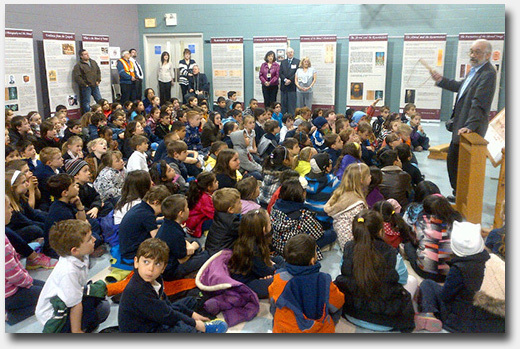 On Monday, March 5th I will be making two presentations to the students at St. Joseph's School in Martinsburg, WV. March 16 - 18, 2018 - I will be presenting at the Cathedral of St. John Berchmans, 939 Jordan Street, Shreveport, LA 71101. On Friday, March 16th I will make presentations at Loyola High School and St. John Berchmans' Middle School. On Saturday, March 17th I will give a presentation at the Cathedral from 9:30am - 11:30am and this event is open to the public. On Sunday, March 18th from 9:15am - 10:45am, I will speak to the Adult Faith Formation. If you are interested in attending the Saturday event, visit the Special Page they have created on the Cathedral's website for details. If you decide to attend, you can easily access their Secure Registration Form and safely purchase tickets for the event online. On February 5th, the local ABC affiliate, KTBS-TV, ran a story on the Shroud titled, Is This the Face of Jesus? 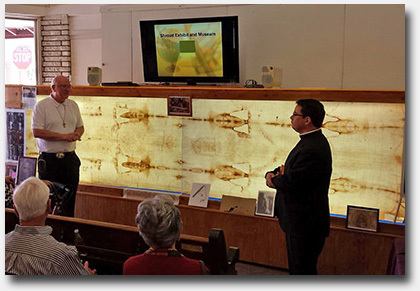 Shreveport researchers examine ancient Shroud of Turin. The 4 minute video includes news of my presentations and a view of one of our lifesize replicas on display in the Cathedral. 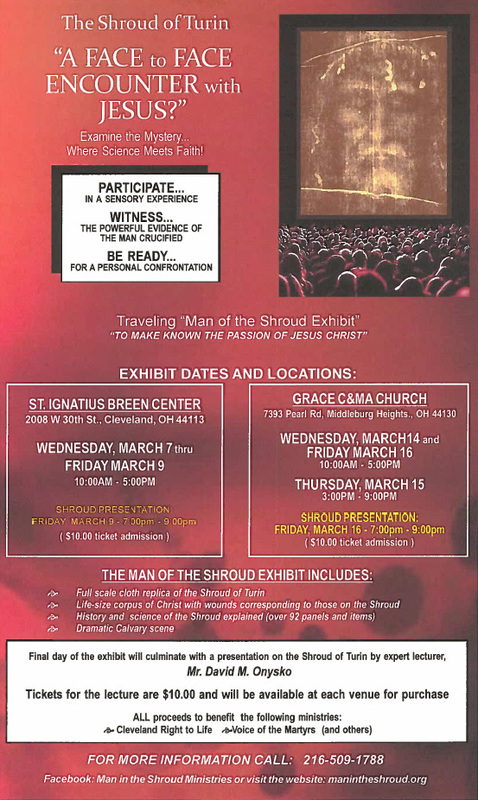 April 6 - 10, 2018 - I will once again be lecturing along with the Vancouver Shroud Association's "Man of the Shroud Exhibit" at St. Peter's Roman Catholic Church, 541 Silvergrove D, Calgary, AB T3B 4R9, Canada. On Friday, April 6th I will make one presentation at 7:00pm. On Saturday, April 7th I will lecture at 1:00pm and 7:00pm. On Monday, April 9th I will give two student lectures at 10:00am and 1:00pm and an adult lecture at 7:00pm. On Tuesday, April 10th I will give two student lectures and an evening adult lecture (same times as April 9th). If you are in the Calgary area, come by, see the exhibit and say "hello!" May 7 through May 17, 2018 - I will again be teaching my Shroud of Turin course in the Masters of Science and Faith program at the Ateneo Pontificio Regina Apostolorum in Rome. This year the course has been expanded to 24 lectures: Part 1 covers the STURP Science and Part 2, the post-STURP science. IMPORTANT UPDATE FROM ROME: My dear friend Fr. Andrew Dalton, LC, just informed us that the Ateneo is now offering their first English language online course in collaboration with the International Center of Sindonology (Turin) and the Giulio Ricci Diocesan Center of Sindonology (Rome). Registration will be limited to just 50 students and is now open. You can visit the Science and Faith Institute website for more information or to register for the new Postgraduate Certificate in Shroud Studies. You can also read this Press Release or watch a YouTube video Fr. Dalton made describing the new program. The enrollment deadline has now been extended to March 24th. August 3 - 5, 2018 - I will once again be in England and speaking at the 52nd Annual Jalsa Salana Ahmadiyya Muslim Community Convention in Hampshire near Guildford. I will post more information as soon as it becomes available. August 28 - 30, 2018 - I will once again be in Indiana and speaking at a number of venues. On Tuesday, August 28th I will speak to students at Purdue University in West Lafayette. On Wednesday, August 29th I will speak at the First Christian Church of Kokomo from 6:30-8:30 pm and this event is open to the public. On Thursday, August 30th I will speak to grade 3 through 8 students at Holy Cross Central and Saint Philip Neri Catholic schools in Indianapolis. September 25 - 27, 2018 - I will spend three days at the Cistercian-Trappist Monastery of Our Lady of Calvary, 11505 Route 126, Rogersville, New Brunswick, E4Y 2N9, Canada, giving several seminars and making Shroud presentations to the monks and their invited guests. October 12, 2018 - I will participate in a three day event commemorating the 40th anniversary of the STURP examination of the Shroud at a dinner and Shroud of Turin Panel Discussion with panelists Russ Breault, Dr. John Jackson, Rebecca Jackson, Fr. Peter Mangum and Dr. Cheryl White at the Cathedral of St. John Berchmans in Shreveport, Louisiana. Russ will give his "CSI Jerusalem" presentation on October 11th and John will present �The Shroud Research Project� on October 13th. Here is a link where you can get more details and information about attending the various events: St. John Berchmans Celebrates STURP's 40th Anniversary. As I mentioned elsewhere in this update, we suffered a complete computer crash on January 12th and I have been struggling to complete this update on an eight year old laptop. Fortunately, I was completely backed up prior to the crash so we didn't lose any data. However, until the main computer is up and running again, I do not have access to the backed up files and that limited what I could include in this update. Of course, we will include those items in our next regular update. In the last 24 hours before the update went online, I received several important items that I felt shoud be included so I am listing them here. Bob Rucker, organizer of the event, reports that many of the conference papers are now available through his website at this link: http://www.shroudresearch.net/conference-2017.html. Of course, those papers will also be linked from our Pasco Conference page in a future update. Last year I was contacted by the Internal Revenue Service (IRS) here in the U.S. regarding an item they intended to auction that was obtained through probate proceedings. That item was a master film-to-tape transfer on one inch videotape (an obsolete professional format) of David Rolfe's "Silent Witness" film that had been authorized by the film's American distributor, Independent International Films, on October 27, 1978. Due to the subject matter, the IRS asked if I could include a notice of the auction here on Shroud.com and I agreed. They provided us with two pdf files and I am including them here in case you are interested: IRS Notice of Public Auction (which includes photographs of the tape master) and an IRS Mail In Bid Form in case you wish to bid on the item. Please note that purchasing this item DOES NOT INCLUDE the copyright or any rights to distribute the film and would require a one inch video player/recorder to view it. I don't have an exact date for the next update, but I do know it will occur sometime in the Spring. Due to our recent unfortunate computer crash, there is a large backlog of material I couldn't include today, so you can expect to see it next time. My travel and lecture schedule through the Lenten season is rather extensive this year, but I will get to the next update as soon as time permits. I do know for sure that it will include more issues of Rex Morgan's Shroud News, the latest papers, books, articles and videos and of course, any breaking Shroud news. To be sure you don't miss any important Shroud information as it occurs, check our STERA, Inc. Facebook page from time to time, since we now try and update it every week or so to keep you informed between our regular quarterly website updates. You can also join our Website Mailing List and receive an e-mail whenever the site is updated (3 or 4 times per year) or any important Shroud news breaks. We hope you find this update interesting and useful and look forward to seeing you in the Spring! Thank you all again for being there! It is deeply appreciated.